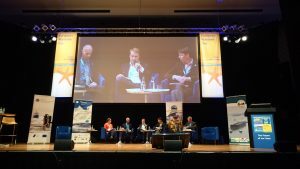 Maritime safety and security were the main topics at the European Maritime Day 2017. ChemSAR contributed to the theme by co-organizing a workshop on Preparedness at Sea, focusing especially on the developing and sharing of practices for vessels engaged in emergency situations at sea, and on how the results from the various projects could be used to enhance cooperation, knowledge and understanding in the future. The chief outcome of the panel discussion held was that all the outputs from the work implemented in different projects should be available for others to access and also to contribute to. The panel was unanimous on this. 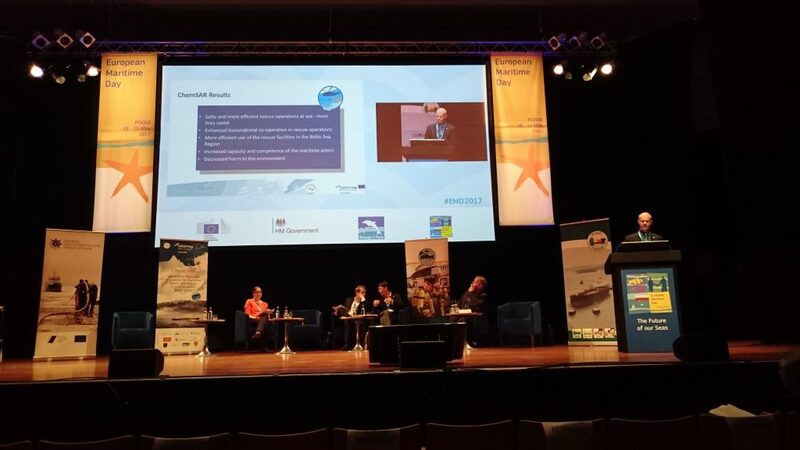 The 10th European Maritime Day Conference took place in Poole, United Kingdom, on the 18th and 19th of May 2017. A delegation from the Finnish Border Guard, one of the core ChemSAR project partners and leader of the other involved projects, hosted the workshop. The workshop was moderated by Mr. Dave Sheppard, Maritime Consultant, Emergency Response and Safety Management. Mr. Jori Nordström, Project Manager of the Vessel Triage project and Head of Operations at the Finnish Lifeboat Institution, presented the vessel triage method. It is a method for assessing and communicating the safety status of vessels in maritime distress and accidents. The method is intended for use by both, the vessels and the maritime search and rescue actors. Mr. Juho Kurttio, the former deputy project manager of the Baltic Sea MIRG project and adviser at the Finnish Border Guard Headquarters, presented the outcome of the Baltic Sea MIRG project. The project was established by the Finnish Border Guard as the responsible maritime search and rescue authority in co-operation with Finland’s Emergency Rescue Services. The project created joint MIRG coordination models and operational guidelines for the Baltic Sea region and supported the harmonisation of MIRG services in Europe. Mr. Teemu Niemelä, work package leader of the ChemSAR project and adviser in the Maritime Safety and SAR Unit at the Finnish Border Guard Headquarters, gave a presentation on the ChemSAR project. The project will create the operational plans and standard operational procedures needed in SAR operations of hazardous and noxious substance (HNS) incidents. The presentation covered the contents of the project’s work packages (Operational plans and procedures, E-learning material, Chemical data bank and Pilot activities: tabletop, simulator and rescue exercise at sea), and the current development stage of the project. Ms. Johanna Terva, Project Implementation Team member at the Finnish Border Guard Headquarters, presented the European Coast Guard Functions Training Network. ECGF Training Network is a voluntary association of educational institutions providing education in the field of coastguard functions in the member states of the forum. Membership is open to all officially recognised educational institutions. The projects aim at supporting rescue operations in case of vessels facing hazardous conditions. Vessel TRIAGE method has been developed for enhancing the communication between the involved parties by focusing on the safety status of the vessel. Its intended application is to assess and communicate whether a vessel can provide a safe environment for the people onboard. Response teams are transnational in essence, and request common codes and procedures to maximise interoperability and coordination between authorities. The Baltic Sea MIRG project has answered to this need by developing joint MIRG coordination models and operational guidelines for the Baltic Sea region and by supporting the development of MIRG services in Europe. The main objective of the ChemSAR project is to create uniform operational plans and standard operational procedures to save human lives in maritime hazardous and noxious substance (HNS) incident areas in a manner that the lives of the rescue crews are be protected and the impact on the environment is minimized. Preparedness implies educational cooperation and training, thus the European Coast Guard Function Training Network aims at enhancing educational cooperation and exchanging of knowledge, skills and best practises in the field of coast guard functions in order to reach efficient use of resources and operational results. The safety projects could fit into regional maritime strategies, e.g. in the Arctic, in relation to the International Maritime Organization (IMO) or Arctic Council. European Maritime Day brings together Europe’s maritime community to exchange ideas and enhance cooperation. Over 600 participants all over the world attended the conference.